Have a fun and relaxing time assembling them on your own, with your kids, or with the whole family! Solve 120 unique levels in 6 new different rooms of Santa's house and earn many unusual winter trophies! 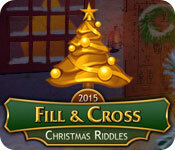 Fill And Cross Christmas Riddles is rated 3.1 out of 5 by 11. Rated 4 out of 5 by Andovape from Christmas Nonogram I am writing this review after playing the first 2 rooms, each with 20 levels. There are six rooms. I love nonogram-type games and play each one when they come out. So far, the levels have all been solved using logic - no guessing or use of hints. This fact alone made the game an instant buy for me. The game has no timer - no time to beat - so you can take as long as you like to solve each puzzle. It has a full screen mode which makes it easy to see, even with older eyes. The background scenes are all Christmas related, and the nonogram images are somewhat Christmas themed, though they are harder to recognize in the earlier levels. My only complaint with the game is the lack of auto fill of the blank squares when the line is complete. I guess I have gotten used to that perk since playing the Gizmo series. I do enjoy not having to beat a timer! I rated the game at four stars just because it doesn't have the sophistication of some of the other nonograms offered by BFG, but it is still a nice way to spend an hour (or more:) if you enjoy this type of game. Rated 4 out of 5 by pennmom36 from If They Would Only Add Some Color! I have enjoyed all of the Fill and Cross Riddles from the Halloween edition to the Pirate themed edition, but why do they insist on such mono color grids? 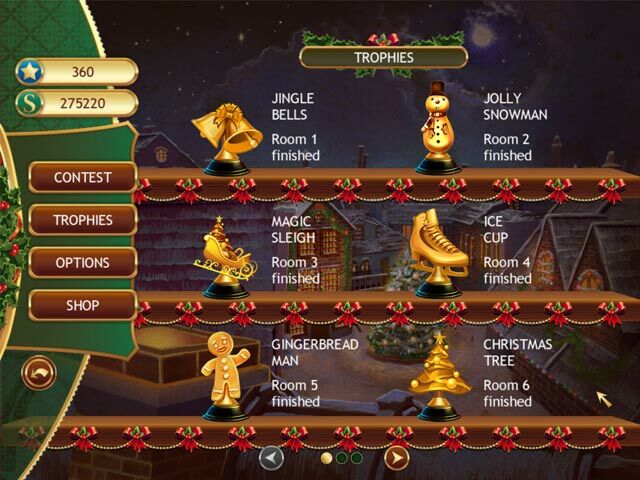 The graphics are okay and the Christmas music is pleasant, and there are trophies to earn as well. The puzzles progress quickly and I did notice that the clicks were very sensitive especially when clicking on an entire row. You are only allowed 2 mistakes before losing and having to restart the level. 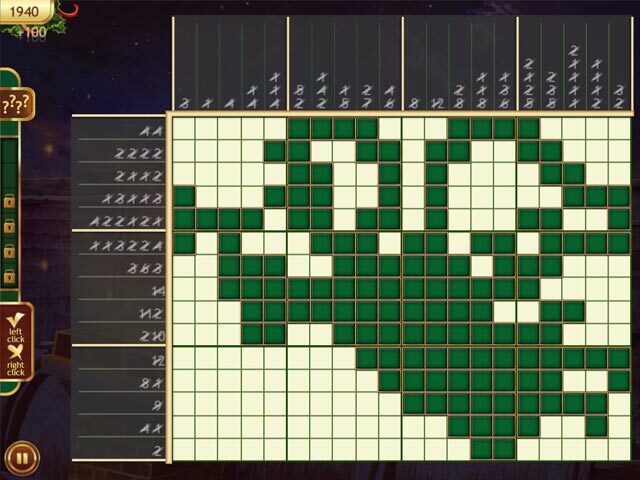 the object of the game is to figure out which tiles are lit up to form a picture on a grid format. Each horizontal and vertical row have a specific amount of tiles to be lit, after that number has been figured out for instance 2 2 2 1 would mean 2 tiles lit. an x in the next space two more tiles lit an x space and so on. Once you get the hang of it you will probably get quite addicted, enjoy! Rated 4 out of 5 by Kay_Kae from Can't Win Without Hints As far as I can tell, and I'm about an hour in, you can't actually solve most of these puzzles without using some of the hints. In the early 5x5 grids, it was possible to solve without hints, but when it's the 10x10+ grids and it says "5 items per line", I don't see how you're supposed to solve this without hints. That having been said, I really enjoy the game. It's like a Sudoku type of game without all of the numbers. It's very challenging (I have no idea how another reviewer said this wasn't challenging?? ), and I love doing Sudokus. It's clear that whoever developed the game was not a Native English speaker. That's perfectly fine, but it might take a bit of trial and error to figure out how to play the game if you've never played a game like this before. Easy to play with a laptop trackpad. Has no time limits. Still haven't figured out what the "holiday" theme is, but it's still an enjoyable game that features a lot of puzzles. Rated 4 out of 5 by kim0530 from Christmas game I honestly wanted to give this game a five star. Love the graphics, the music is excellent (put me in the Christmas Spirit) the storyline (to me) is going to a Christmas party. The main reason why I didn't give this a five star is because of the challenge. Either I'm getting good on these kind of games or this is simple. In the demo alone, I got three stars (some with only one mistake) and I'm on level 12 and it took me only 10 mins. It starts out with 5 X 5 grids and that took me only a few seconds. This game is for a relaxing evening with some hot chocolate or with the kids. But it's not a challenging game because even I can get three stars with no problem I will purchase this game for the relaxing time and it did put me in the Christmas Spirit but don't expect to be challenged. Rated 4 out of 5 by grammaria from Hard with an iMac mouse I love these types of games, however with an apple mouse, the game has a hard time determining "plus" or "X". I've found this with other games and have had to go to a two-button mouse as opposed to an apple mouse. Sometimes the games have a square you can click to switch back and forth, but this does not. Even that is a hassle. Otherwise the game seems good. Rated 3 out of 5 by arnold1049 from TOO MUCH WORK The graphics on this game are beautiful. It's major drawback, and it is a big one, is that, when a column or row is filled out correctly, the remaining squares are not automatically crossed off. This means you have to cross them off manually, requiring a lot of extra work and time for a game that is just average. Too much hassle. Rated 3 out of 5 by sandyknitwit from Puzzles I love doing this kind of puzzle, but thought this one was a dud. I kept playing, thinking eventually there would be some kind of recognizable picture. Not impressed and won't purchase! Rated 3 out of 5 by femme29 from Disappointed I love this type of game, however the "present" reward does not appear on my Mac even though the grid has been solved correctly. There is no Christmas design that develops or appears. Rated 2 out of 5 by ChocPeng from Where Are The Riddles? I have conquered rooms one and two, and I have yet to stumble across any of the "Christmas Riddles" this game's title promises. You play a regular mosaic game (it is a mosaic game; it is nothing like a Sudoku game). However, due to the lack of contrast between active and inactive squares, it is almost impossible to determine a picture; in my experience, each puzzle appeared to be a random placement of active and inactive squares. Above it says, "Solve all of Santa's riddles and get 120 presents..." What are the riddles? Are the mosaic games supposed to be riddles? In my world, a riddle is a word game, usually containing irony, that must be solved by logic. I have loved all of the mosaic games I have played here at BFG and other locations. They are great fun. But this game is awful. It never even tells you what the picture was supposed to be. And, I didn't even realize these mosaic games WERE creating pictures until I came back here and looked at the screenshots and saw that they were pictures. 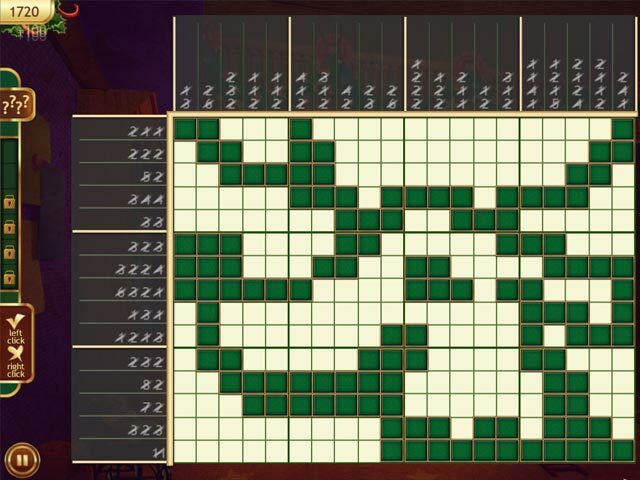 Others may have gotten further and found another aspect of this game not yet revealed after completion of 20 mosaic puzzles. If so, I stand corrected. I just don't think there is anything else here. Oh, and as for needing hints, beginners probably need to rely on hints, but any player who is at least an intermediate player should be able to quickly begin to recognize the strategies that are required to complete these puzzles. I'll admit – I'm not in favor of using hints at all. I believe they are a crutch that lazy people lean on instead of sticking it out on puzzles and taking the time to figure them out, even if that means leaving the puzzle until tomorrow and beginning again with fresh eyes. It is only by doing this that players can begin to progress to the intermediate and expert levels. And finally, when I see someone who has "Expert" under his or her name and then talks about hints in games or how quickly it takes for them to engage, then it is clear that player is no expert. Expert players don't use hints! If you are using hints, you aren't an expert. All my best to my fellow fishies! Rated 2 out of 5 by stonzee from very annoying Nice concept but the fact that it keeps telling you not to make mistakes is highly annoying. Then in the actual game play it only gives you two mistakes before it stops and resets the puzzle. The game would be better if you could take your time and figure out the puzzles on your own. But you don't get the chance.